Hey, look! I actually finished something!! Which is good because it has seriously been nothing but Starteritis City around here, so it's nice to have something off the needles. I just wish I was also able to put the needles back in their package and feel even more accomplished. But no, instead I had immediately cast on another pair of socks. Like I said, it's been about casting on all the projects around here lately. I know I'm not the only one feeling the need to knit every pattern that I see, but enough about that. Let's talk about these socks! I'm actually a little surprised that I finished them. The pattern, Business Casual by Tanis Lavallee, is a fun and easy knit; and the yarn, 80/20 Sock by Lichen and Lace, is wonderful (and beautiful!) to work with. 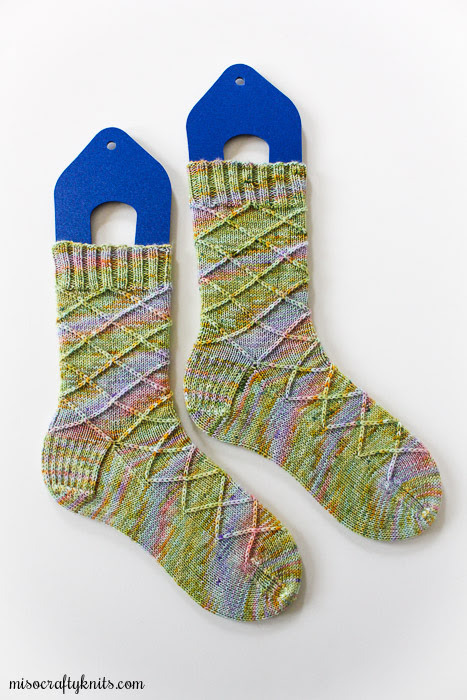 I thoroughly enjoyed watching these two knitterly elements work up into a pair of socks. I enjoyed it so much that I was a bit sad to see the project end. I do have another skein of Lichen and Lace in the Pressed Flowers colourway on the same base, which I probably won't knit with anytime soon because well, let's face it, I get distracted by pretty yarns way too easily. As in I could be dead-set on knitting with a specific skein for weeks and then change my mind like that (imagine me snapping my fingers) for no particular reason. Also, I am sort of making myself knit with yarns that I have acquired from past knitty events, just to make myself feel better about my stash (and maybe, just maybe I'll allow myself to purchase more without guilt at the next knitting event?). I didn't get bored even once while knitting these socks. I also made no modifications as I thought the pattern was pretty perfect as is. 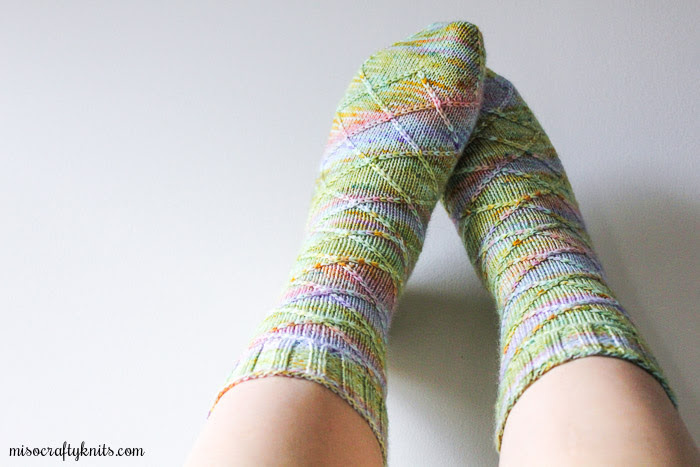 I had read a few project pages on Ravelry in which knitters had mentioned that the socks fit pretty snug due to the stitch pattern, and many knitters had to go up a needle size in order to make the socks fit comfortably. I had hemmed and hawed about doing this too but ended up using my go-to needle size - which is a 2.25mm (US 1). I think using DPNs really helped in making me more aware of how tight I yanked on the working yarn with each stitch and ultimately helped in getting a looser gauge that made the sock fit nicely and not at all overly tight. 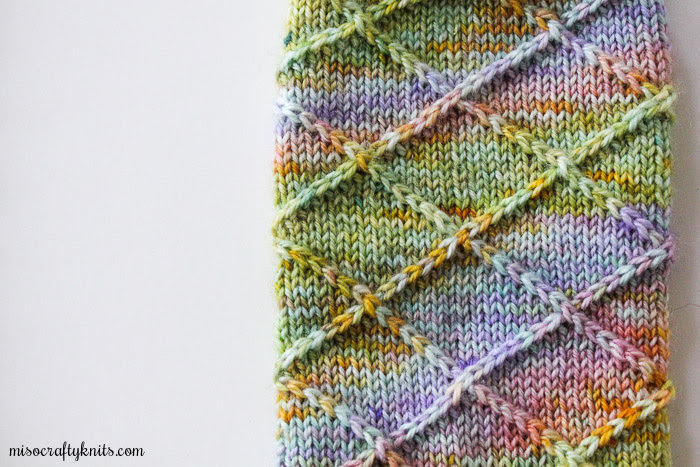 I would definitely recommend this pattern to any sock knitter, even to an advanced (or adventurous) beginner - as long as they already know the basics of sock knitting and sock anatomy. 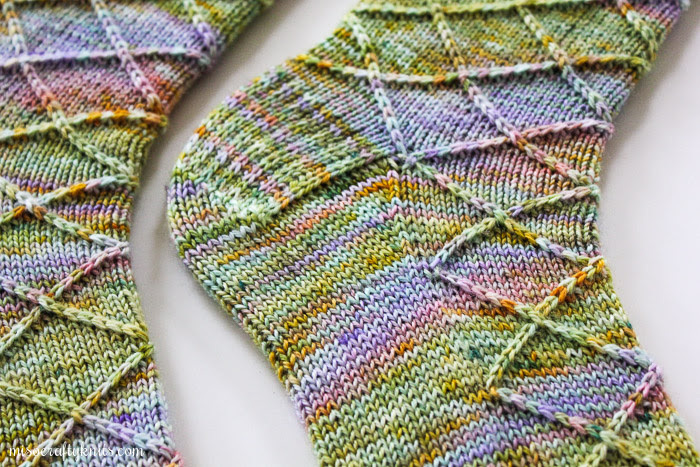 I'm already looking forward to knitting another sock pattern by Tanis Lavallee called Smokestack Socks, possibly even knitting it in some Tanis Fiber Arts sock yarn! I have a fair amount of yarn leftover (about a quarter of the skein) and I had pondered knitting a sample of the two-stitch cable pattern so that I could frame it or insert it into an embroidery hoop a la Purl Soho's Liberty of London Swatch Portraits. That was the game plan for quite a while until a few weeks ago when I was overcome with this intense need to knit crazy leggings. While I would love to preserve this gorgeous combo of yarn and pattern in the form of a framed piece of knitterly art, I think I would also love to be able to wear this yarn in something else other than socks. BUT I've got gifts to knit, so I'm going to have to put the idea of hand knit leggings aside for now. Which means I'm going to also set aside the leftovers until I can make a final decision. But how awesome would scrappy knitted leggings be?? So awesome that it makes me want to knit my gifts just a smidge faster. Until I can make that decision, I think I'll just enjoy these marvelously colourful socks during these dull, dreary and cold winter days for now. I found your blog whilst looking up knitting things on the net and have really enjoyed seeing the fantastic things you've made. Your socks are really cool! I was wondering if you could recommend a sock pattern for a first time sock knitter please? Thank you. Fantastic, thanks so much! Sometimes getting started is the hardest part and a good book or similar resource makes all the difference. I agree! So I really hope that these books help. Also, I've noticed with a few friends who really wanted to like sock knitting, that sometimes switching how you knit the socks (I had a friend who wanted to knit toe-up socks but realized she actually preferred top-down) or even the needles you use, can make a huge difference. these are stunning, I love that yarn you chose SO much, and what a perfect pattern for it! I will have to give that pattern a whirl. Hi! My sister is starting to knit socks, and she mentioned that she needs some blockers ... I like the look of yours - please share: what's your source? Thanks.